Set in Oxford in the 1660s - a time and place of great intellectual, religious, scientific and political ferment - this remarkable novel centres around a young woman, Sarah Blundy, who stands accused of the murder of Robert Grove, a fellow of New College. Four witnesses describe the events surrounding his death: Marco da Cola, a Venetian Catholic intent on claiming credit for the invention of blood transfusion;Jack Prescott, the son of a supposed traitor to the Royalist cause, determined to vindicate his father; John Wallis, chief cryptographer to both Cromwell and Charles II, a mathematician, theologian and master spy; and Anthony Wood, the famous Oxford antiquary. Each one tells their version of what happened but only one reveals the extraordinary truth. Brilliantly written, utterly convincing, gripping from the first page to the last, An Instance of the Fingerpost is a magnificent tour de force. 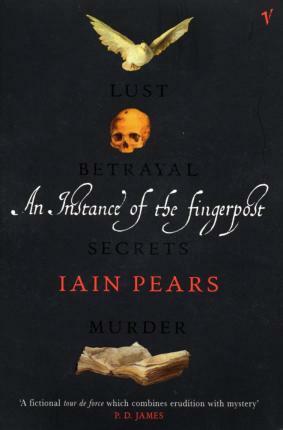 "A fictional tour de force which combines erudition with mystery"
Iain Pears was born in Coventry in 1955. Educated at Wadham College, Oxford, he has worked as a journalist, an art historian and a television consultant. He is the author of several highly praised detective novels, a book of art history, countless articles on artistic, financial and historical subjects, and The Dream of Scipio and Stone's Fall.